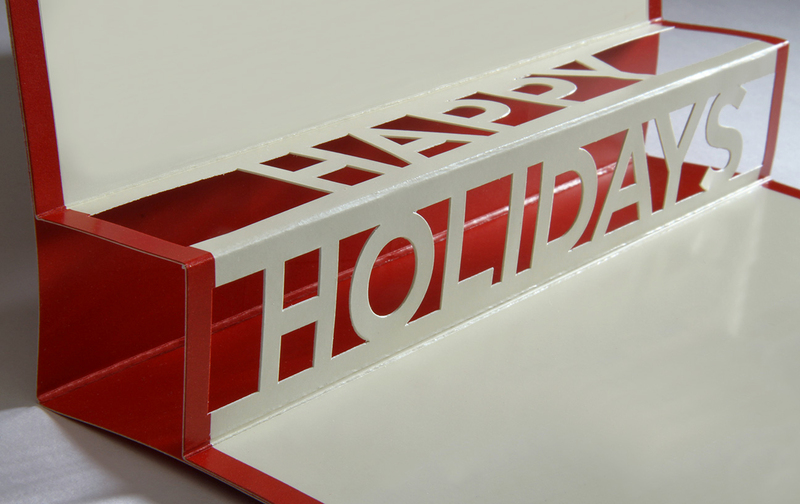 Another highresolution client, Turner Sports, designed a pop-up die cut greeting (at top) that invited touch and made their card stand out from the pack. Cards that are interactive, that fold into a sculpture or unfurl into a mobile or that come in a box with some dimensional element inside are always fun and memorable, with the feel of a gift. David Drucker can help you with intricate combinations of techniques for dimensional cards including die-cuts, laser-cuts, grommets, glistening foil stamps and inclusion of unique and unexpected non-paper materials and elements. Or, make your cards a gift. Design a set of 6 beautiful postcards, either seasonal or a perhaps a seasonless design wrought with letterpress production and we’ll get them made up for you and placed in an envelope with a simple vellum slip sheet with your holiday greeting. Your clients, colleagues and friends will enjoy using those postcards and will think of you each time they use one. What a great and simple idea! 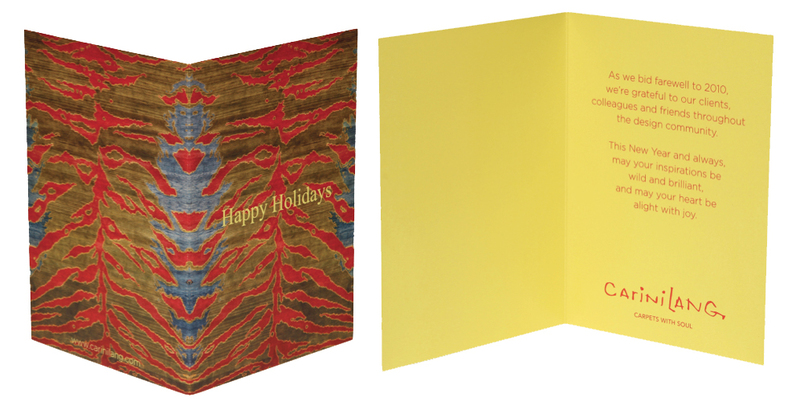 highresolution creates printed pieces that sing with the most accurate color possible, so your holiday cards can capture attention just through color. 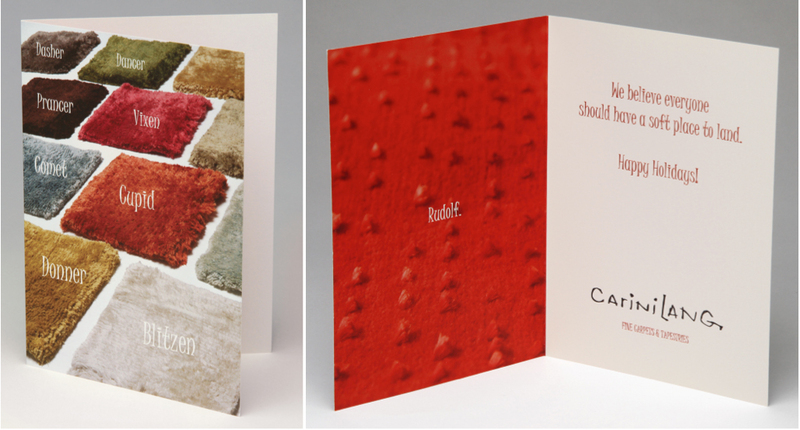 Carini Lang makes carpets that are renowned for their beautiful botanically-dyed colors, so one year, they chose a vivid tiger carpet and asked highresolution to coat the entire inside of the card in chrome yellow to reinforce their statement. The brand message was relatively subliminal, “we create beautiful, rare colors” but the warm holiday greeting was clearly stated. The Guru recommends creating a card that “evokes the spirit and intimacy of a handmade holiday card.” highresolution has access to some of the most elegant materials and techniques for creating beautiful, tactile and special cards. Many of the most elegant cards the Guru has produced we can’t properly show you here because they’re embossed or hot stamped in elegant white on white. (He’ll be happy to come to your office and show you, though.) In this spirit, he says, “be sure to take the time to use actual USPS postage stamps. Never put a gorgeous card through the company postage meter.” You can also take the time to have someone from your office go and get your cards hand cancelled at the post office. In Manhattan you can get this done at the historic James Farley Post Office – you know the one across from Madison Square Garden that has the post office creed inscribed in the stone atop the full-block length of entabulature atop its impressive Corinthian columns. 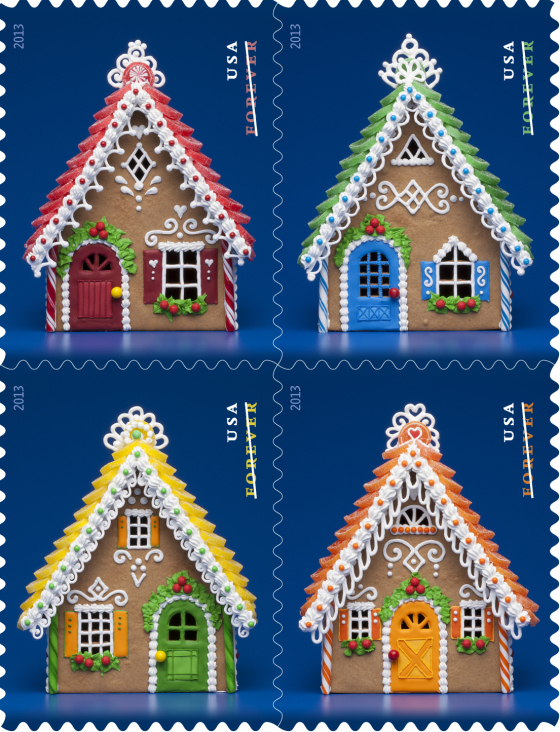 This is also a good karma post office from which to launch your holiday greetings, because not only is it an architectural and historic landmark, but it is the original home of the nonprofit Operation Santa Claus. Having your envelopes hand cancelled won’t prevent the bar code across the bottom from the sorters but it will keep your postage area clean and pretty. You wouldn’t want a big smear of ink on your tasty gingerbread house would you?